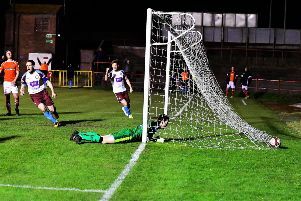 Gavin Cogdon struck a second-half winner as South Shields deservedly won on the road for the first time this season last night. The Mariners produced arguably their best performance of the campaign so far to get the better of Stalybridge Celtic. The 1-0 victory moved them up to second in the Evo-Stik Premier Division as they made it four wins out of six. Shields bosses Lee Picton and Graham Fenton opted to make no changes to the team which beat Nantwich Town 4-0 on Saturday. They were rewarded with a purposeful start as the Mariners kept possession well and were patient on the ball. The opening goal almost arrived in the sixth minute when Cogdon beat his man with some splendid skill on the inside-left of the area, but goalkeeper Jake Turner did well to kick away his low effort. Celtic could not be discounted, though, and Shields goalkeeper Liam Connell was forced into a decent low save when Chris Sharp tried to catch him out from distance. Josh Gillies had a fine chance to put the visitors ahead when Robert Briggs picked him out with a through ball, but Turner was again on hand to save Stalybridge. The home side’s best chance of the first half came seven minutes before half-time when they broke quickly and Liam Tongue played the ball across the area to John Marsden, who could only divert it over. The Mariners started to build some pressure again in the second half, and went close when a Blair Adams cross from the left deceived Turner and struck the bar. Matty Pattison and Gillies both struck efforts not far wide before Shields went agonisingly close when the ball dropped to Ursene Mouanda from a corner and his curled shot struck the crossbar. The breakthrough finally arrived 14 minutes from time when the Mariners launched a counter-attack. It was led by Cogdon, who played in sub Dan Wright down the left of the box. Wright’s effort came back off the post but Cogdon picked up the loose ball and fired it in via the woodwork to delight the travelling Shields faithful. There could have been further goals, and the closest Shields came to increasing their lead came when Cogdon rifled in an effort which Turner pushed behind. Shaw was also denied by Turner as he got on the end of a corner, and although Stalybridge pushed to find an equaliser, they were unable to trouble the unflappable Connell. The Mariners now take a break from league action as they await a home FA Cup tie with Garforth Town on Saturday. SOUTH SHIELDS: Connell, Baxter, Adams, Shaw (c), Morse, Turnbull, Mouanda, Briggs (Lough 71), Cogdon, Pattison (Wright 71), Gillies. Subs not used: Pearson, Hunter, Harmison. Goal: Cogdon (74). Attendance: 326.